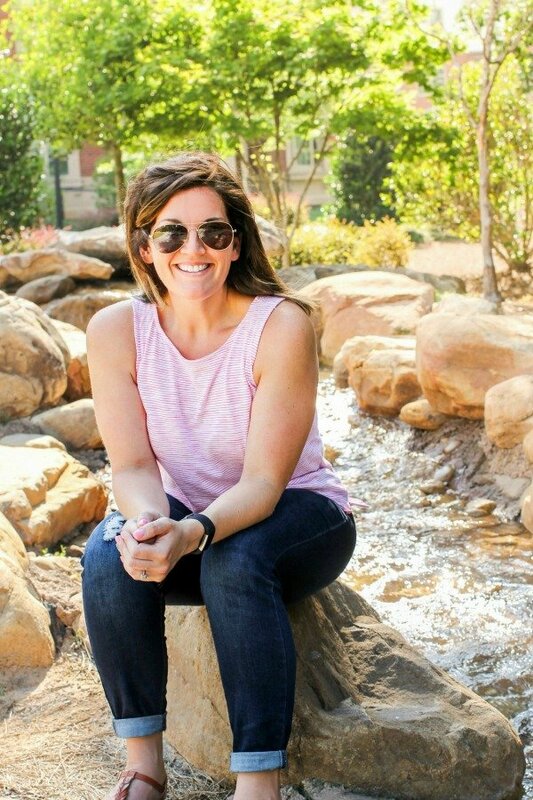 February 19, 2019 By Allyson 21 Comments This post may contain affiliate links. Read my disclosure policy. Vegetarian Portobello Philly Cheese Steaks are stuffed with mushrooms, peppers, and onions then topped with provolone cheese. Super delicious and ready in 20 minutes! 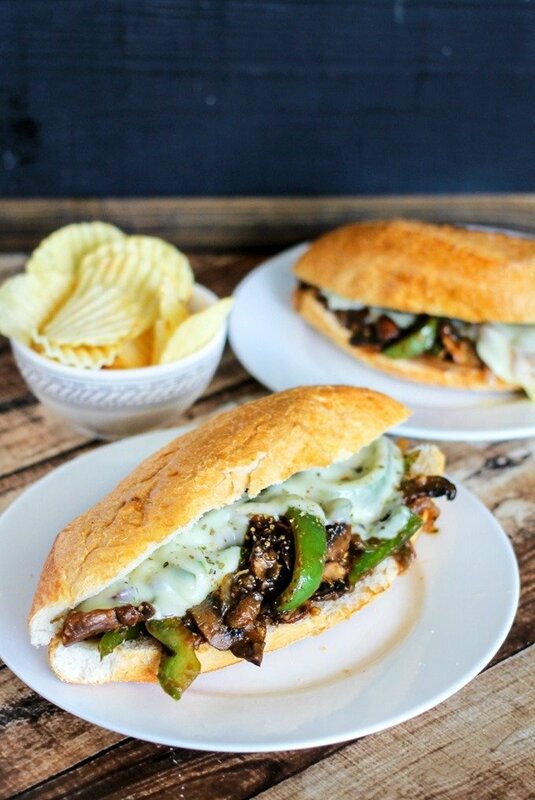 Vegetarian Portobello Philly Cheese Steaks are the perfect meatless meal. They come together in 20 minutes, and are just as filling as the meat version. 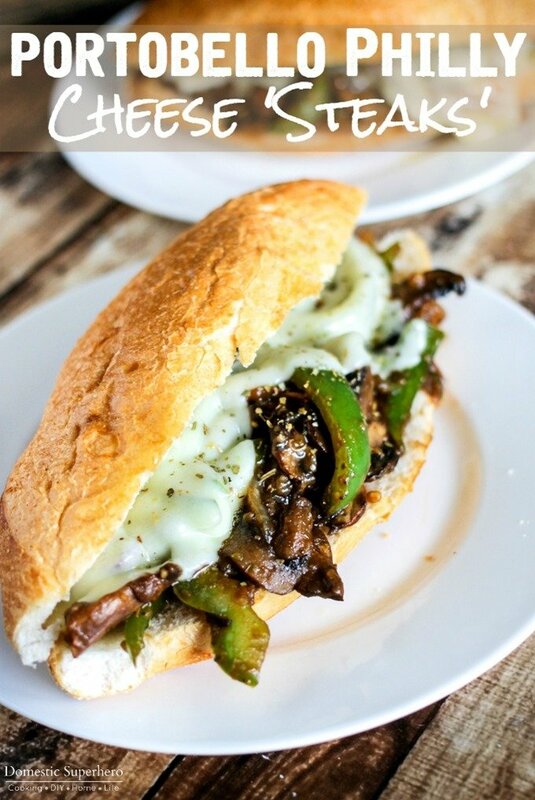 Whether you are trying to save money by going meatless, being more health conscious, or a vegetarian, you will LOVE these Portobello Philly Cheese Steaks. 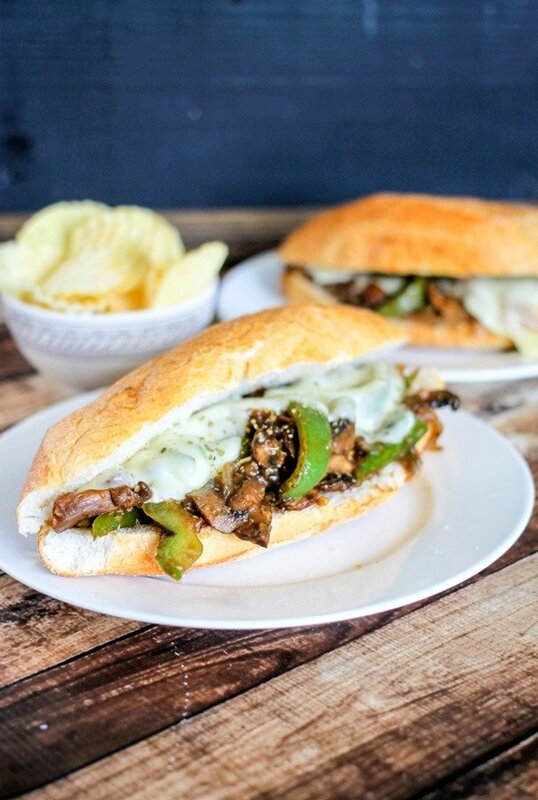 If you are a meat lover, this recipe would be perfect for meatless Monday, or you could easily add some chopped steak to the sandwich, but trust me when I say, these Portobello Philly Cheese Steaks are super ‘meaty’ without the meat – insanely delicious and super easy to make! Serve them with some Super Simple Buffalo Potato Wedges or a Southwestern Salad and it’s the perfect meal! This is one of those awesome recipes that comes together in under 20 minutes, and you would never be able to tell. The flavor on the vegetables is rich and deep, and it’s a very satisfying sandwich. The following recipe is for 2 sandwiches, but can easily be doubled to make 4 sandwiches. Get all the ingredients prepped and ready to go. Add the vegetables to a skillet*, then cook for about a minute, then sprinkle on the seasonings. Continue cooking them until they are tender and the onions are translucent. I recommend getting the large portobello caps for this recipes, and slicing them thin to mock a steak strip, but you could also use baby portobello (cremini) mushrooms. I’ve used both with success. Sprinkle flour over the veggies and then stir to coat. Add the veggie broth and soy sauce, then stir to disperse. Turn the heat to medium high and cook for about a minute. The liquid should come up to a quick boil and thicken very quickly. Turn the heat off and remove. If you like a crispy roll, toast the rolls for a few minutes, then add the filling and a slice of provolone cheese over the top. Enjoy! 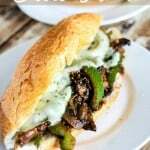 *If you want to add steak steak to the the Portobello Philly Cheese Steaks, cook the steak first and throw the veggies in the skillet when there is about 5 minutes left to cook the steak. Continue with remaining directions. Can I use a different cheese in a cheese steak? If you don’t care for provolone cheese on a vegetarian Philly cheese steak, there are other options that will work. While not traditional, they are delicious! 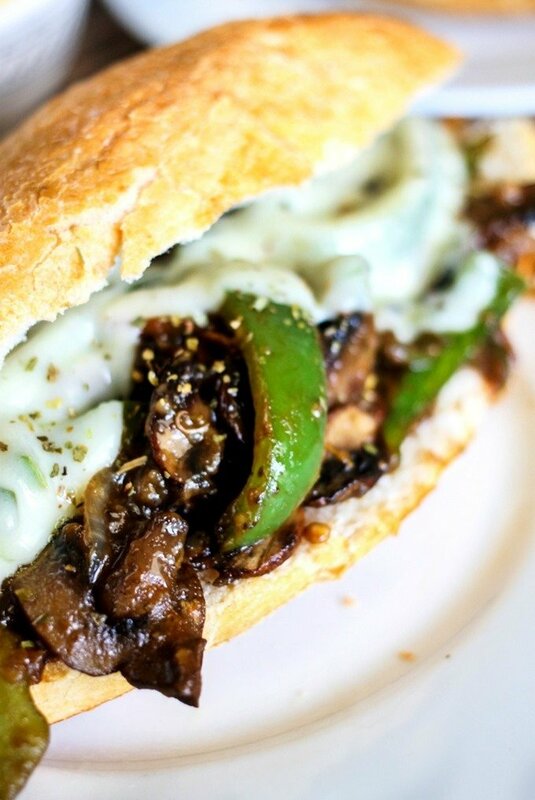 Havarti, gouda, or mozzarella cheese would all work wonderfully on a vegetarian portobello philly cheese steak! Is a Vegetarian Cheese Steak Healthy? Healthy is subjective, but I do think it’s a good option depending on your diet. I calculated the nutritional information, but it will be subjective on the rolls you buy, so make sure to calculate with your ingredients if needing the information to be accurate. Each sandwich contains about 394 calories, 9 grams fat, 4 grams saturated fat, 62 grams carbohydrates, 6 grams fiber, 9 grams sugar, and 19 grams protein. They also contain over 100% of your daily Vitamin C! To make it lower carb (South Beach Diet, KETO): Use a cloud bread or low carb roll. The roll could also be left out entirely and the filling could be served over cauliflower rice or a salad. To make it Gluten Free: Use a gluten free flour in the saute step like almond or coconut flour. Both should work fine. Instead of traditional soy sauce use tamari which is a gluten free soy sauce. Use a gluten free roll for the sandwich or leave the roll out entirely. Simple Buffalo Potato Wedges are easy to make and ultra delicious. Air Fryer Roasted Broccoli is healthy, takes only a few minutes, and is the perfect side dish. Air Fryer Roasted Asparagus will be your favorite way to cook asparagus from now on! With only 2 ingredients and taking a fraction of the typical time, they make an easy nutritious side dish! Air Fryer Crispy Parmesan Brussels Sprouts are going to be your new go-to side dish. Only a handful of ingredients and only 132 calories per serving! Roasted Red Pepper Soup is the perfect comfort food without any guilt! Make it in the Instant Pot, Slow Cooker, or on the stove top! In a large skillet, spray nonstick spray, and add onions, portobello mushrooms, and green peppers; sauté for 1 minutes. Sprinkle oregano and black pepper over the vegetables, and continue cooking for 4-5 minutes or until they are tender. Sprinkle flour over the vegetables and stir to coat with the flour; continue stirring for 1 minutes. Add vegetable broth and soy sauce to skillet, and turn heat to high. Stir to distribute and dissolve flour. Cook for about another minute, or until sauce has thickened (should be quick). Place filling into each sub roll, and top with a slice of cheese. Garnish with more oregano if desired. Serve immediately. *Recipe can be doubled to make 4 sandwiches. Is there enough flavor to make these worthwhile without the cheese? My son is vegan and even fake cheese doesn’t cut it for him. I guess he’s natural food vegan – difficult but I love him. I think so! I have had them without cheese and love them just as much! YAAAAS. Such a sucker for a good Philly sandwich, and I love this veggie-filled version! Looks delish! This sandwich looks so mouthwatering!!! I cannot wait to make these! I bet they are a hit! These look like so much fun. I can’t wait to make them for the family ! Great idea for Meatless Monday! You fooled me! When I first saw the pictures I thought it was beef. Looks just as rich and yummy as the classic! This is right up my alley! Can’t wait to try it! He probably wouldn’t even notice! New favorite dinner! Thank you so much! This look delicious! I cannot wait to try this!! I can’t wait to try this!! I looks incredibly delicious!! I am drooling over this sandwich! I will make it for lunch tomorrow!